Whether you're helping a friend celebrate a wedding or want to send a corporate hamper to wish a colleague a happy Diwali, when you need to send a gift to India, we're ready to help. With hundreds of options from wines to cheeses and flowers to toys, we guarantee your present will arrive on time and in perfect condition. Why risk ruining an occasion because it's stuck in the mail? We ensure delivery including 2-day, expedited shipping and will even follow up with both you and the recipient to make sure everyone is happy. Having trouble finding the right option? Use the filters on the top to shop by occasion, price or theme. If you still can't find what you're looking for, contact support and we'll help find a gift that meets your needs. Shopping for the perfect present has never been easier and knowing it will arrive on time no longer has to be a worry when you use GiftBasketsOverseas.com to send gifts to India. Having trouble knowing what to send? There's no need to stress. Below you'll find a few common questions our support team gets so you can find the perfect option easily. What makes a Good Wedding Gift in India? Unlike the USA, traditional colors for Indian weddings are red and gold. Choosing something that features these in the packaging and items is always a great choice. You can also opt to send a red and yellow bouquet of flowers if you don't know what their taste in treats are. What Makes a Good Business Gift? Unlike in the USA, the cost of the gift is going to be part of the business relationship. Indian culture values meaning and spirituality before the total cost of a gift, especially with business gifts in India. Try to think of something that will cement the relationship instead of being flashy and expensive. Alcohol is also not a wise gift unless you know that the recipient and the people who will be present upon receiving it are alcohol drinkers. Opting for vegetarian hampers like a fruit basket could be a wise decision. You'll also want to avoid anything with dairy or leather as the cow is sacred in Hinduism. Do I Need to Send a Rahki Gift? No, this is a holiday between brothers and sisters where the brother gives the sister a gift during the holiday. With that said, if a family has taken you in as one of their own and you want to send the sister a Rahki gift, it will probably be taken well and appreciated. Just be cautious as this is a personal and family-oriented holiday. Should I Send a Gift Basket for Holi? If you send a gift for Holi, it will be considered ''sweet''. Cakes, snacks and treats that do not have dairy will be a perfect way to celebrate the festival of colors. Look for packaging, decorations or treats that are vibrant and colorful as this holiday is all about celebration, singing, dancing and of course, bright colors. Much like in the USA and other countries, these holidays are celebrated with gift giving. 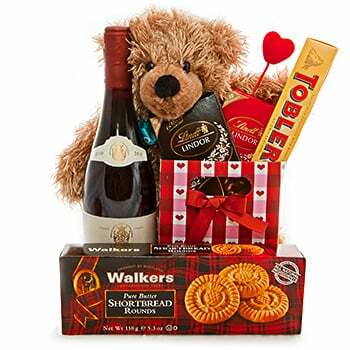 Popular options include flowers, fruit and snack baskets, chocolates, non-alcoholic and non-dairy hampers and sometimes items for relaxing like a robe or pajamas. Yes, Christmas is celebrated in India, although is not a main religious holiday. The important thing here is to remember there are cultural differences. Avoid sending Christmas gifts to India that include leather goods like a desk set in case the recipient is Hindu. Jewelry and watches (even though well intended) are considered intimate gifts and are reserved for family members. Many Indians are vegetarian and will accept, but potentially be offended by, gifts with dairy like a cheese and meat basket or alcohol. Instead, fruit hampers, candy gifts and bouquets of flowers are smart options. Even if the recipient is not vegetarian and does drink, if it is a corporate gift, others around them may get offended: potentially a decision maker-within the company, and that could be bad for business. Warangal, and large cities in India. Interested to have gift delivered to India from your country?